If you haven’t already, check out this nice R blog with lots of code for good ggplot2 and lattice figures. This entry was posted in Statistics & Methodology, statistics/R and tagged R code, visualization. Ah, while I am at, I may as well put this plot up, too. The code needs to be updated, but let me know if you think this could be useful. It’s very similar to the calibrate() plots from Harell’s Design library, just that it works for lmer() models from Doug Bates’ lme4 library. The plot below is from a model of complementizer that-mentioning (a type of syntactic reduction as in I believe (that) it is time to go to bed). The model uses 26 parameters to predict speakers’ choice between complement clauses with and without that. This includes predictors modeling the accessibility, fluency, etc. at the complement clause onset, overall domain complexity, the potential for ambiguity avoidance, predictability of the complement clause, syntactic persistence effects, social effects, individual speaker differences, etc. 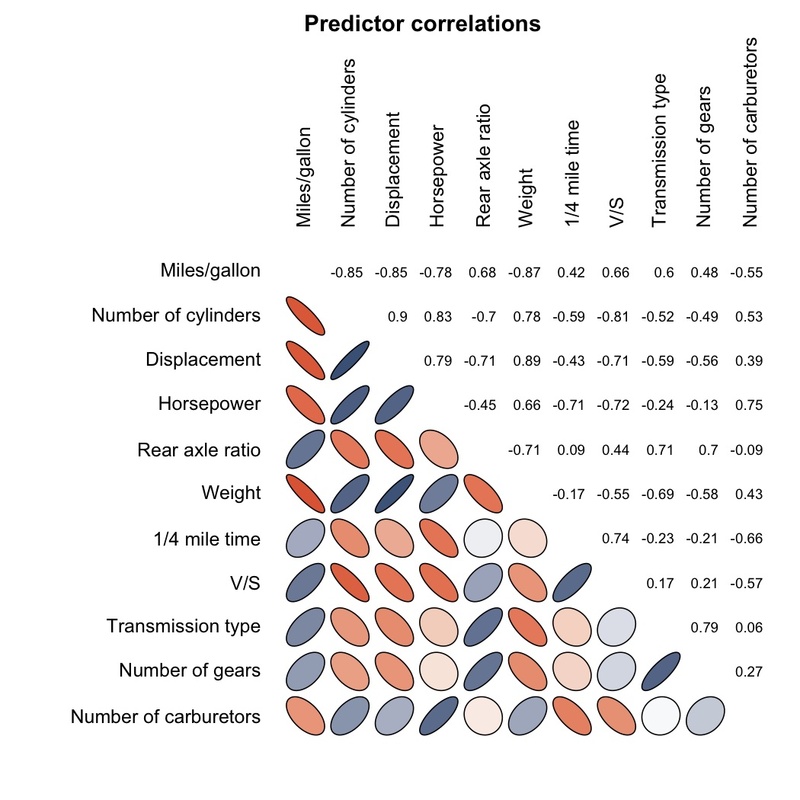 Visualization of mode fit: predicted probability vs. observed proportions of complementizer "that"
Mean predicted probabilities vs. observed proportions of that. The data is divided into 20 bins based on 0.05 intervals of predicted values from 0 to 1. The amount of observed data points in each bin is expressed as multiples of the minimum bin size. 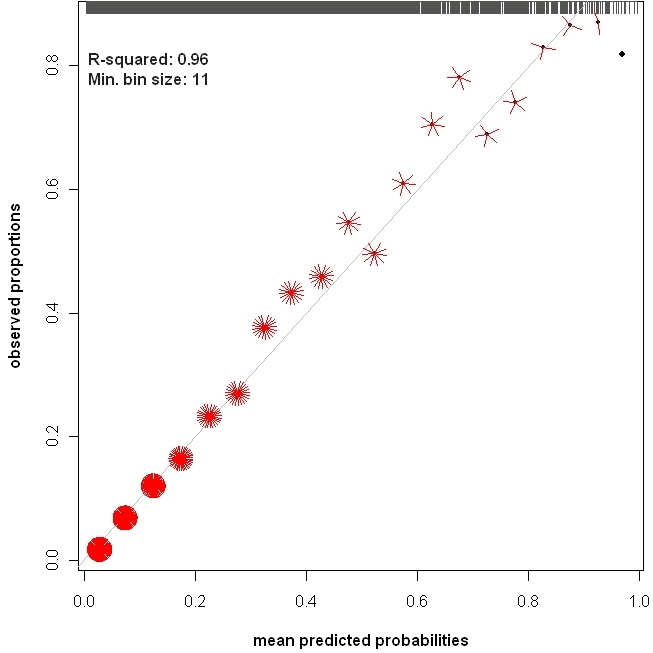 The data rug at the top of the plot visualizes the distribution of the predicted values. See Jaeger (almost-submitted, Figure 2). 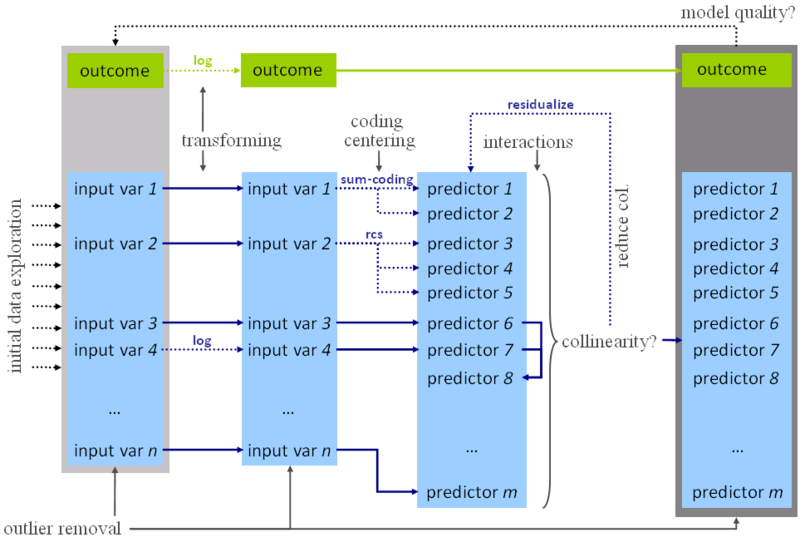 This entry was posted in HLP lab and tagged evaluation, mixed logit model, multilevel logit model, R code, visualization. UPDATE 12/15/10: Bug fix. Thanks to Christian Pietsch. UPDATE 10/31/10: Some further updates and bug fixes. The code below is the updated one. UPDATE 05/20/10: I’ve updated the code with a couple of extensions (both linear and binomial models should now work; the plot now uses ggplot2) and minor fixes (the code didn’t work if the model only had one fixed effect predictor). I also wanted to be clear that the dashed lines in the plots aren’t confidence intervals. They are multiples of the standard error of the effect. These plots contain the distribution of the predictor (x-axis) against the predicted values (based on the entire model, y-axis) using hexbinplot() from the package hexbin. On top of that, you see the model prediction fo the selected predictor along with confidence intervals. 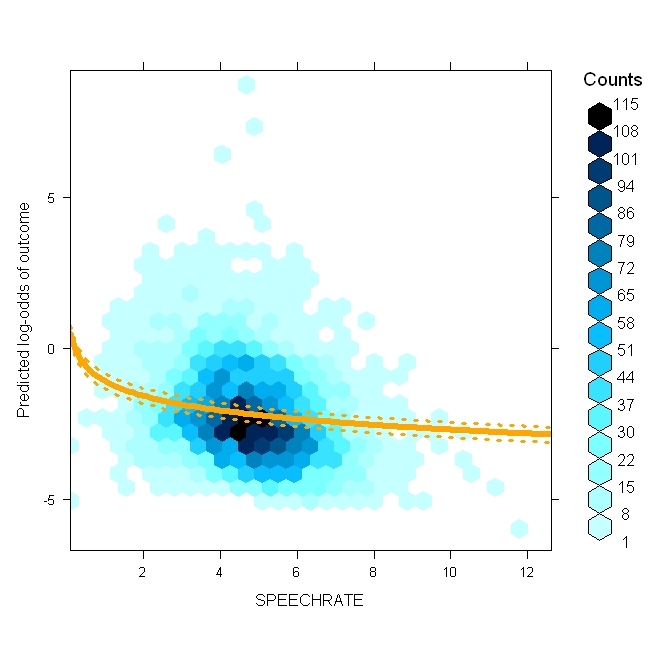 Note that the predictor is given in its original form (here speech rate) although it was entered into the model as the centered log-transformed speechrate. The plot consideres that. Of course, you can configure things. This entry was posted in HLP lab, Statistics & Methodology, statistics/R and tagged hexbinplot, lmer, mixed logit model, multilevel logit model, plot, R, visualization. This entry was posted in corpus-based research, statistics/R and tagged linear mixed models, R code, visualization.